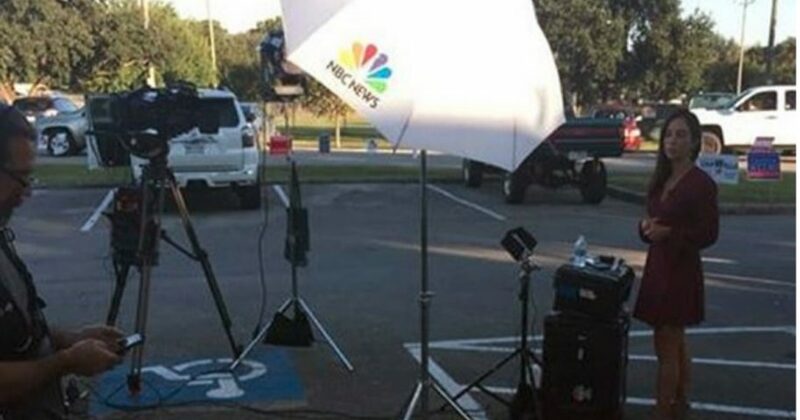 An MSNBC crew was cowed into offering an abject apology after a disabled Air Force veteran blew the whistle last week on the crew’s use of handicapped-accessible parking spaces for a live shot near a Houston polling place. “Went to vote, and found this waiting for us,” veteran James Berrie wrote on Facebook. “The only van accessible spot and they’re filming in it. We asked them to move, pointed out how it was wrong, then went to vote, because it takes time to load up. But came out and still there. Not even packing up, still getting ready for their shot,” Berrie wrote. “Then Sarah made a big scene and did not back down. They claimed they had a live shot, so Sarah walked into the shot. They cut the feed and got pissed. Fortunately other people joined in, plus firefighters who where there for Prop B. We finally left once their van was loaded,” Berrie added, referring to his wife’s tactics against the MSNBC crew. “This is suppression. If I couldn’t park I couldn’t vote. Their van had no handicap placards. And this happens all the time. Handicap spots are not loading zones for gear and equipment. Figure something else out. Especially at a public event where people are going to need the spots. This is not OK, and the station needs to be made aware. All of them,” he posted. “News will be out in force, now and until the general. The media needs to be aware. Call them out if you see this,” he later added. In its reporting, WTSP noted that the crew took up “two handicapped spaces and one handicapped loading zone.” The MSNBC crew’s decision forced Berrie to park in a back lot, where he could only exit his van with difficulty. According to KHOU, the crew kept insisting it needed to occupy the spots for a little bit longer. Should authorities have ticketed and fined the MSNBC crew for its actions? The coverage brought MSNBC a slap from former Fox News and MSNBC host Greta Van Susteren. “Really @MSNBC? Handicapped spot? Not very nice…in fact, indecent,” she tweeted. Once MSNBC had what it needed, it repented. Berrie said on Facebook that the episode was proof that making noise can lead to action. “Thank you all for your support. This has gotten bigger than I thought, but that is a good thing. People are talking about this, having the conversation. Please keep going. If you see something, say something,” he wrote.